In the United States, a variety of taxes and fees on passenger air tickets help fund airport infrastructure. The major federal taxes on passenger air travel raised $12.05 billion for the Airport and Airway Trust Fund in 2013. This trust fund allows the Federal Aviation Administration to fund infrastructure through the Airport Improvement Program. Reliance on Airport Improvement Program spending is cumbersome and inefficient for airports that could be paying for the costs of their own improvements. The Passenger Facility Charge, an optional fee levied by and remitted to airports, also funds airport infrastructure. It has been capped at a maximum value of $4.50 per trip for fifteen years, and it has lost much of its value to inflation. The Passenger Facility Charge is the most market-based solution for airport funding, reducing reliance on federal taxes and allowing local communities to make informed cost-benefit analyses. 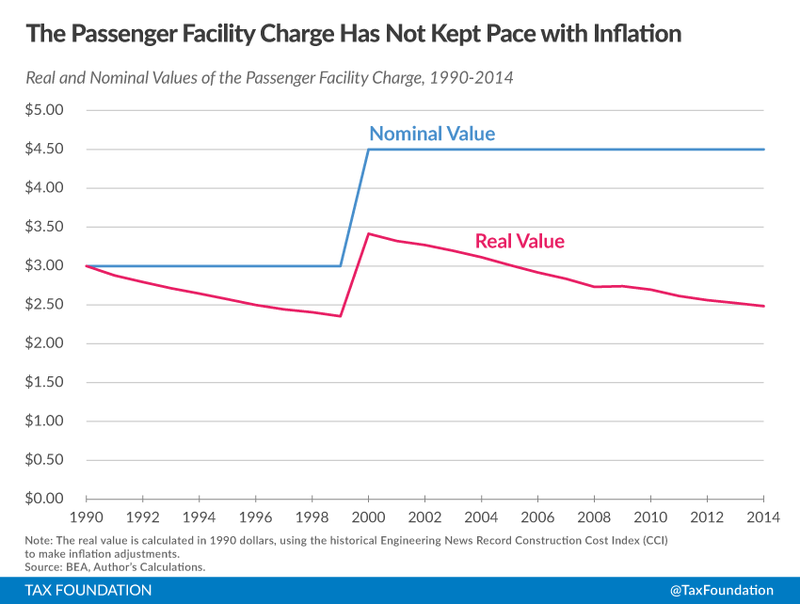 The outdated federal cap on the Passenger Facility Charge should be raised and indexed to inflation. Alternatively, the upper limit on user fees could be set entirely at the local level. Commercial air travel is a critically important sector of any advanced economy. This is especially true for a country as large as the United States, where some domestic travel can only practically be done through the air. In this type of economy, air travel has a large role as a business input and as a consumer good. The U.S. aviation industry is a growing one; though demand fell during the recent recession, economic conditions have since changed. Passenger traffic is rising once again at both the domestic and international levels. The Federal Aviation Administration (FAA) expects the number of passengers carried annually to reach a record-high 775.8 million by fiscal year 2015, and continue growing up to 1.14 billion people by the year 2035. This report is concerned with the ways that airport improvements will be funded to accommodate that growth. It addresses the outdated airport financing structure and recommends that local communities, not the federal government, make decisions about the modernization of airports through the use of updated user fees. Public policy on airport spending should be more in line with the benefit principle. According to the benefit principle, the people who use a public service should generally be the ones to contribute to that service. This approach allows projects to be approved or canceled on their own merits, by the people who best understand the costs and benefits. Commercial service airports in the United States already have such a mechanism for infrastructure improvements, known as the Passenger Facility Charge (PFC), a fee paid directly by users and tied to specific airport projects. However, the outdated cap on the PFC set by Washington hamstrings the airports’ ability to charge for the use of their facilities and instead keeps them overly reliant on federal grants distributed from federal ticket taxes. Additionally, many taxes on commercial passenger air travel do not always fund projects that benefit the average commercial passenger. These federal taxes deserve gradual replacement with a more locally-controlled, user-based fee structure. There are several major excise taxes on passenger air travel that raise revenue for the Airport and Airway Trust Fund, a fund administered by the FAA. Additionally, there is a substantial fee for passenger security screening administered by the Transportation Security Administration (TSA). An overview of these follows. Domestic Passenger Ticket Tax (7.5 percent of ticket price) – This is a simple ad valorem excise tax on the purchase price of passenger tickets. Airlines collect this tax on behalf of the passenger and then pass it along to the IRS on Form 720. Its revenue is used for the Airport and Airway Trust Fund, which funds the Airport Improvement Program (AIP), a federal grant program for airports of all sizes. It is collected in combination with the domestic flight segment tax (below). Domestic Flight Segment Tax ($4.00 per passenger per segment) – This is a lump-sum excise tax on each domestic flight segment (defined, simply, as a takeoff and a landing). The value of this tax is indexed for inflation. It is similar to the domestic passenger ticket tax, and they are collected and reported simultaneously. Combined, the two taxes raised $8.80 billion in 2013 for the Airport and Airway Trust Fund. International Arrival and Departure Tax ($17.70 per international flight, $8.90 per flight between the continental U.S. and Alaska or Hawaii) – The per-passenger lump-sum taxes are higher for flight paths that go outside of the 48 contiguous states, but the collection mechanism is similar to that of the domestic flight segment tax, and the revenue goes to the same place. Like the flight segment tax, these values are indexed for inflation. This tax raised $2.87 billion for the Airport and Airway Trust Fund in 2013. Excise Tax on Kerosene for Use in Commercial Aviation ($0.044/gallon) – Air carriers pay a small excise tax on jet fuel, also on IRS Form 720. This tax is not nearly as large on a per-passenger basis as the passenger excise taxes described above. Commercial jets are extremely fuel efficient per seat, therefore, $0.044 per gallon is not very much money in light of that efficiency. Nonetheless, it is a small additional cost to air travel. This tax raised $380 million in revenue for the Airport and Airway Trust Fund in 2013. September 11th Security Fee ($5.60 per one-way trip) – This fee is collected by airlines on behalf of the passenger and remitted to the Transportation Security Administration. The security fee is included in this summary for the sake of completeness, but this report will focus on airport funding, not security funding. It raised $1.88 billion in revenue for the TSA in 2013. Lastly, travelers are likely to notice a PFC of up to $4.50 per airport. It is important to note that this charge is not a tax at all, in any sense of the word. The charge is neither remitted to nor spent by the federal government, and it is not deposited into the U.S. Treasury. It is a payment made directly to the airports and tied to paying for a specific airport project. However, it is mentioned here because it is relevant as a locally-based contrast to the ticket taxes listed above. This fee is capped at $4.50 per airport – a cap most recently changed under Title I of the Wendell H. Ford Aviation Investment and Reform Act for the 21st Century (AIR 21), signed into law in 2000. Unlike the per-passenger charges levied by the federal government, the PFC cap is not indexed to inflation, causing its purchasing power to erode substantially since 2000. In total, air travel has a variety of taxes and fees, which are supposed to fund our nation’s aviation system. These taxes and fees currently are not sufficiently funding airports. While these taxes and fees, in the broadest sense, fulfill the benefit principle (people who use airports pay for the airports), they could still improve. Particularly, passenger traffic out of the largest airports generates the most revenue, but much of the FAA’s grant program ultimately does not benefit these passengers. While the United States has several thousand airports, most commercial passenger traffic flows through a select few. 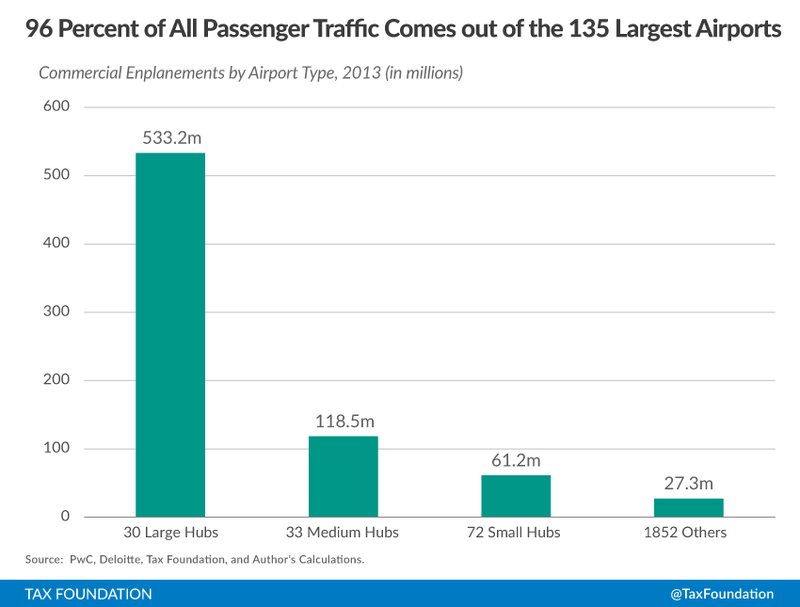 About 96 percent of enplanements (passengers boarding a departing flight) happen at the 135 largest commercial service airports in the country, which the FAA designates as “large, medium and small hubs.” These airports remit the vast majority of the revenue generated by the taxes described above because of the number of passengers that depart from, pass through, or arrive at these airports. Unfortunately, FAA funding does not match the distribution of its revenue. In that same year of 2013, the FAA’s AIP awarded $3 billion in grants, of which $540 million went to projects specifically marked for general aviation airports – that is, airports that do not regularly serve commercial passenger traffic and instead serve private planes. General aviation airports have economic value. In smaller communities, they serve as the main link to outside markets; in larger communities, they serve as relievers for more congested commercial service airports. Airports can be seen as a system with large, medium, small, and general aviation airports serving different purposes and supporting one another. Some degree of joint revenue raising to fund the system as a whole is probably appropriate. But the current system has flaws. Centralization is cumbersome and unnecessary for the many airports that could simply pay for the costs of their own improvements through other methods. The flaws become particularly apparent when a large hub – one with broad effects on the rest of the air travel system – needs an expansion to allow it to service more flights. The tax dollars from its passengers, which are substantial, could fund a significant portion of an expansion project independently. But because those tax dollars have gone to the federal government, the airport essentially has to wait for a ponderous political process to have its own tax dollars returned. That is why the PFC is a more efficient means of financing airport infrastructure; revenue generated by passengers at an airport remains with the airport, dedicated to financing it. The best means of funding airports is to have consumers pay the airports directly. The PFC achieves this objective, and it is directly tied to infrastructure improvements. Specifically, PFCs are dedicated to local airport-related projects that (1) preserve or enhance safety, security, and capacity of the national air transportation system, (2) reduce noise from an airport that is part of the system, or (3) provide opportunities for enhanced competition between or among air carriers. PFC funds have supported runway and taxiway projects, terminal and gate projects, airport-access projects like roadways and transit stops, and noise-mitigation projects. When an airport proposes a PFC to improve airport infrastructure, it must complete a rigorous application process to establish transparency and need. PFC projects are reviewed extensively by the FAA, and the application process includes mandatory consultation with the airlines and the public. In addition, PFCs cannot be used for revenue-producing projects, such as parking garages, rental-car facilities, and terminal areas used for concessions or leased exclusively to a specific airline for more than five years. This method of funding ensures that the benefit principle is satisfied; passengers fund the airports they are using. It makes the cost-benefit calculus a local decision, rather than one subject to centralized authorities and political processes. The optional nature of the PFC allows airports to make their own determinations about the tradeoffs between lower costs and better services. Airports can decide not just the level of the PFC but also whether to charge the fee at all, after assessing the needs and demands of their local communities. Federal deficits and expected tight budgets led to the creation of the PFC in 1990. It started with a maximum allowed value of $3.00, which was adjusted to $4.50 in 2000. It is not inflation indexed, which means that its real value has largely eroded with time. The PFC has become a less substantial source of revenue for airports as time has passed, simply because costs have gone up, and the PFC has not. This problem should be fixed. In the short term, this could be accomplished by increasing the PFC cap to $8.50 to restore the value lost from inflation. As a further step, inflation indexing would solve the problem going forward. The central argument for the PFC is that airports provide services like other businesses, and the most efficient, market-based means of raising funds is to allow them to charge consumers an amount commensurate with the value needed to complete a project. In other words, let airports finance their improvements just like any other productive venture would. This is what the PFC should do. Instead, it is artificially capped at a value deeply below the amount needed to sustain viable infrastructure. Airports provide customers with many valuable services. They maintain runways, taxiways, and ramps for the airplanes, and provide terminals, gates, jetways, and seating areas for their customers. The cost of maintaining these assets is well above the current value of the PFC. An uncapped PFC would be the most free-market solution to this infrastructure problem, but at the very least, Congress must recognize that the current $4.50 cap is arbitrary and not connected to reality in any meaningful way. Airport operators – in concert with local, regional, or state authorities – are best equipped to determine the appropriate PFC levels for their needs. As is currently done, there should continue to be a public-review process that allows community members and other stakeholders an opportunity to share their views before any PFC is adopted. Since the PFC is so out of proportion with the actual costs of maintaining and modernizing an airport, airports are frequently dependent on the federal government for some of their funding – even those airports that do not need to be. In 2013, there were 22 airports with at least 10 million enplanements. The following is an example calculation of what a four-dollar increase in the PFC cap could do for an airport of this size. After the PFC cap rises to $8.50, the airport receives somewhere between $40 and $80 million in new passenger fees. It then issues municipal bonds at 4 percent interest, backed by these fees. In total, it could use the PFC to pay interest on $1 to $2 billion in new improvements. While economies of scale work heavily in favor of large airports under this scenario, airports of all sizes stand to benefit because PFCs can be used as part of a local match for federal AIP dollars. Due to sheer volume, all airports could raise money fairly easily without imposing substantial costs on any individual customer. These ideas are neither revolutionary nor unique to this publication. A more locally-based system of airport funding is already a reality in Canada, where it works smoothly. Ideally, a PFC increase should be coupled with broader reforms that move toward local funding of airports, allowing the federal government to reduce its passenger excise taxes. The current system of airport funding is not ideal for air travelers. The most important, most popular airports generate plenty of revenue for the government but do not necessarily get that money back to spend on their own capital expenses. Much of the funding granted by the federal government could be better spent by the airports directly. The current restrictions on airports’ ability to fund improvement projects are a poor use of federal oversight. Funding projects is an issue for passengers, airports, and local governments to solve. The Passenger Facility Charge is clearly the best means to meet airport capital needs and a far better option than raising taxes or other fees on passengers. However, the cap on its value is simply outdated. The current $4.50 cap should be modernized and indexed to meet the needs of today and future growth. Federal Aviation Administration, Federal Aerospace Forecast Fiscal Years 2015-2035, March 2015, https://www.faa.gov/about/office_org/headquarters_offices/apl/aviation_forecasts/aerospace_forecasts/2015-2035/media/FAA_Aerospace_Forecasts_FY_2015-2035.pdf. Internal Revenue Service, Historical Table 20: Federal Excise Taxes Reported to or Collected by the Internal Revenue Service, Alcohol and Tobacco Tax and Trade Bureau, and Customs Service, by Type of Excise Tax, Nov. 19, 2014, http://www.irs.gov/uac/SOI-Tax-Stats-Historical-Table-20. Transportation Security Administration, Historical Fee Collection Data: September 11th Security Fee Collections, Jan. 2015, http://www.tsa.gov/stakeholders/historical-fee-collection-data. Federal Aviation Administration, All Airports with CY 2013 Enplanements, Jan. 26, 2015, http://www.faa.gov/airports/planning_capacity/passenger_allcargo_stats/passenger/media/cy13-all-enplanements.pdf. Federal Aviation Administration, FY 2013 Grants Awarded, Oct. 16, 2013, http://www.faa.gov/airports/aip/grant_histories/media/fy2013_aip_grants.pdf. Passenger Facility Charges, 14 C.F.R. §158, 2015, http://www.gpo.gov/fdsys/pkg/CFR-2015-title14-vol3/pdf/CFR-2015-title14-vol3-part158.pdf. Daniel-Robert Gooch, “Why Canada’s airport model is working for taxpayers,” The Globe and Mail, March 7 2014, http://www.theglobeandmail.com/globe-debate/why-canadas-airport-model-is-working-for-taxpayers/article17368507/. 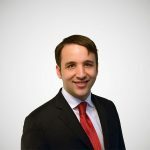 Alan was an Economist with the Center for Federal Tax Policy at the Tax Foundation from 2013 to 2017. Alan’s research on federal taxes has been cited in Congress and in newspapers around the country.